Holly Holm reacts after her knockout victory over Bethe Correia of Brazil in their women's bantamweight bout during the UFC Fight Night event at the Singapore Indoor Stadium on June 17, 2017 in Singapore. 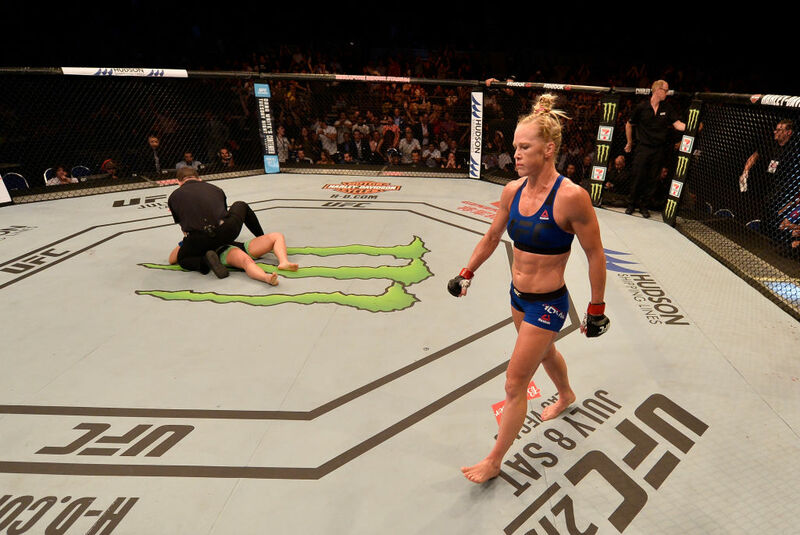 (Photo by Brandon Magnus/Zuffa LLC/Zuffa LLC via Getty Images)" align="center" />Holly Holm has tunnel vision. Having spent the last two years and changes shuttling between two divisions, competing in championship fights and headlining assignments, the Albuquerque, New Mexico native is locked in on her upcoming featherweight fight with Megan Anderson this weekend at UFC 225 and nothing else. “I’m excited to fight Megan,” said Holm, who continues to freelance between the featherweight and bantamweight divisions, taking the most compelling and intriguing fights available to her, wherever they arise. “I do still want to go back if I’m able to have the opportunity to fight for the 135 belt, but I’m just kind of wanting to get through this fight first. Now 15 fights deep into her mixed martial arts career and poised to step into the Octagon for the ninth time, Holm continues to find the little pieces of each matchup that are fresh and challenging to her each time out, including this weekend’s showdown with Anderson. “There are a couple things about this fight that are interesting to me,” she said of her matchup with the former Invicta FC featherweight champion, who will be making her first trip into the UFC cage on Saturday night in Chicago. “She’s a tall fighter. I think there has only been one other opponent that I’ve ever fought who has been this tall – I fought her twice – so it’s just kind of exciting to face a different style fighter; a tall, lengthy fighter. Looking strictly at recent results, some have questioned why Holm has continued to find herself in marquee matchups each time out, given that the former women’s bantamweight champion has dropped four of her last five appearances. But not all losses are created the same and while she has struggled to find consistent success in the cage over the last two years, “The Preacher’s Daughter” has been painfully close to picking up victories in several of those setbacks, all of which have come against elite female talents. “I know that the record of four out of five fights being losses is not good, but I do know that those losses aren’t like I got just beat,” Holm stated correctly. She was two minutes from victory when she defended the women’s bantamweight title against Miesha Tate at UFC 196 before Tate spun her to the canvas and sunk in a rear naked choke, and her clash with Germaine de Randamie 11 months later at UFC 209 was even closer than the trio of 48-47 scorecards detail. The same goes for her loss to reigning featherweight queen Cris Cyborg at UFC 214 last summer, where she again dropped a tight decision. A couple changes or a stronger round here or there and Holm’s 1-4 mark over her last five could very easily be flipped, producing a very different set of narratives and conversations surrounding the decorated combat sports practitioner. “I’m very honest with myself that I do have these losses, but I also know that if you look at each fight as it is, the losses I have aren’t because of getting dominated; they’re really close fights where people are on the edge of their seats, not knowing which way it’s going to go. “It has been frustrating, knowing that things are that close,” admitted Holm. “If you look at my fight with Cyborg, some people thought Cyborg won and some didn’t know which way they were going to score that fight. Having spent the better part of the last six months in the gym sharpening her skills and working to correct those bad habits, and the last six weeks preparing for Saturday’s main card showdown with Anderson, Holm’s outlook on how she sees this weekend’s return to action plays out is pretty simple.